HOMES have been threatened, but saved, and some sheds have burnt to the ground as investigations continue into suspicious fires across the Northern Rivers. Extra resources will today be on the ground south of Casino, where conditions are forecast to worsen with warmer temperatures and stronger winds. Fire-bombing aircraft were in constant rotation yesterday as crews on the ground continued to work in smoke-logged conditions at Ellangowan, where a fire has burnt through 1628 hectares between Mothersoles and Coraki-Ellangowan Rds. 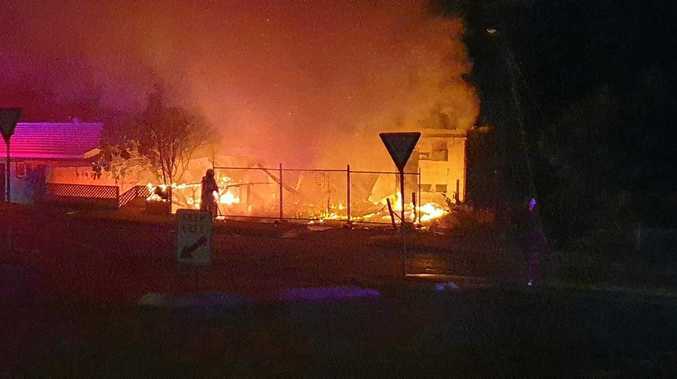 Rural Fire Service Northern Rivers Superintendent Michael Brett said additional fire investigators had been tasked to the region. "Over the last six to seven weeks we've had significant fire activity on the North Coast and we've identified numerous fires that we believe have been deliberately lit," Supt Brett said. "These sorts of acts are ultimately going to end in tragedy for somebody and we need to catch these people and keep them out of the community. "Generally they're doing it at a time when our resources are stretched and it then puts those local communities in danger." Supt Brett said some property, including sheds and other outbuildings, had been lost, and the blaze had come frighteningly close to some homes. "People's lives have now been hit, it's impacting on the community," he said. The Mothersoles Rd fire yesterday challenged containment lines, but crews prevented it from crossing Tatham-Ellangowan Road, Coraki-Ellangowan Road and Emu Park Road. The nearby fire at Wrenchs Rd was still contained. Resident Mick Jobson was yesterday keeping a watchful eye over the fire, still burning in a neighbouring property a short distance from his home. He said Thursday had been "really intense" and he feared he would lose his home. "My heart was pounding and I was a bit worried, very worried," Mr Jobson said. He said reports some of fires across the region had resulted from out-of-control burnoffs was alarming. "You have to be an idiot to light a burnoff in this weather," Mr Jobson said. Richmond Police District Acting Superintendent Toby Lindsay warned those lighting fires illegally would face serious consequences. He said a 52-year-old man, has been charged with lighting a fire in Tabulam on Wednesday and domestic violence offences. That man will face Casino Local Court October 3 and police and the RFS are continuing to investigate other fires across the region. He alleged the fire at Tabulam was "deliberately lit and not for the purpose of a burnoff". "Police are working very closely with the RFS ... to ensure community safety is paramount," Supt Lindsay said. "I appeal to the community to co-operate with police and advise us of any suspicious behaviour." Mothersoles Rd resident John MacDonald lost a large amount of equipment when the fire hit his property on Thursday. His family, home and horses are safe. "It's pretty horrific, the whole thing," he said. He praised the work of firefighters and said on-ground and aerial crews had shown a "valiant effort". "These fellas are risking their lives to help you save your house so I'm just thankful," he said. Nearby resident Gordon Hutchings said the fire had reached the corner of his property, but had not come close to his home. 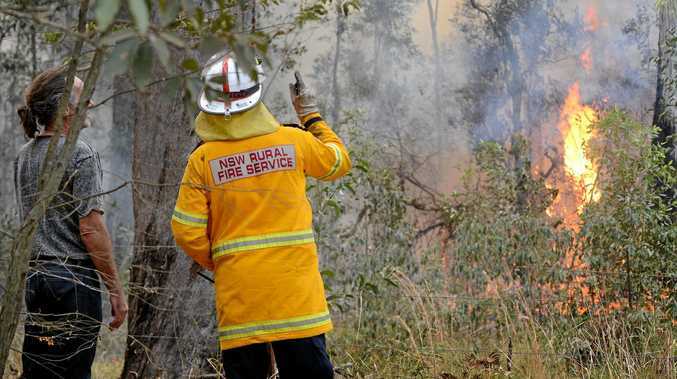 Wyrallah rural fire brigade captain Steve Garbutt said a move to channel resources from across the state into the Northern Rivers would give local crews, who had been run off their feet for about seven weeks, a much-needed rest. He said his crew was, however, in good spirits as they liaised with residents. "We know they're under a lot of stress and we're here to actually give them support, emotional support as well as fire protection," he said. Fire permits are currently suspended for the Northern Rivers fire zone. Report suspicious behaviour to Crime Stoppers on 1800333000 and in an emergency, phone Triple 0. For updated fire danger information visit rfs.nsw.gov.au or phone the Bush Fire Information Line on 1800679737.